You’d never guess it by the name, but Fujitsu’s Next Generation User Interface Technology is designed to bridge the divide between digital and printed information. 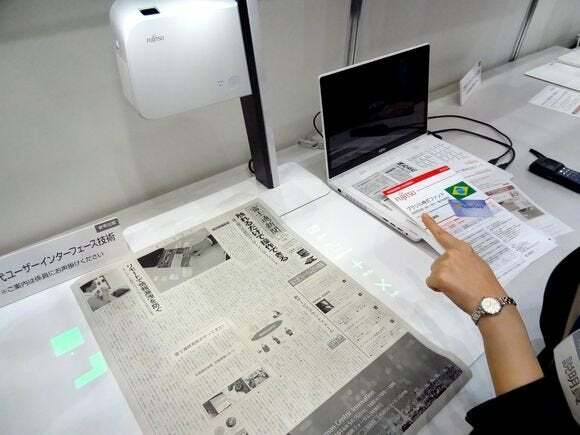 The electronics giant’s prototype scanner-projector can be used to scan blocks of text or individual articles in a newspaper simply by outlining them with a finger. The latest version of the device consists of a scanner and projector unit mounted on a stand above a board. It’s controlled by tapping icons projected onto the board. Shown off this week at the Fujitsu Forum technology open house in Tokyo, the latest prototype can perform text searches in printed matter. In a demonstration, when a Fujitsu staffer entered “Fujitsu,” the projector highlighted the word at various places in a newspaper page laid out beneath it. Another improvement compared to previous editions of the prototype is that users can make clippings of complex article shapes. For instance, users can point out the corners of an article that appears as an “L” shape on the page. The machine then highlights it, scans it and projects a thumbnail image of it on the board next to the page. Scanned articles can then be assembled into digital scrapbooks. The device can also link page features to projected online information that’s changing in real time. For example, information printed on a flyer can be linked to online stock or fund prices that are projected on the board. One application would be sales people using flyers to explain services to customers while the projector displays updates or information that change often. The unit can also recognize customers through pre-registered smart cards, and project information related to previous transactions. Fujitsu hopes to bring the device to market by the end of March 2015.